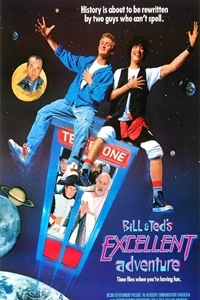 Bill Preston and Ted Logan are two totally excellent dudes facing one most heinous history exam. With the help of Rufus an ultra-cool messenger in a time traveling phone booth, the triumphant two-some bag a bevy of historical heavy weights like the "Bodacious Philosopher Socrates, "One Very Excellent Barbarian" Genghis Khan, the "Short Dead Dude" Napoleon and Noah's Wife Joan of Arc to stage the most hysterical high school project ever. History's about to be rewritten by two guys who can't even spell.